Portraits of soldiers in uniform were already common in peacetime, particularly in middle-class families. The individual portrayed here was Christine Roller’s brother-in-law. The postcard was sent in November 1914, just a few months after the start of the war. Although this photograph was taken out-of-doors, and thus without the benefit of backdrops and traditional accessories commonly used in studio portraits of soldiers, one can see that the photographer still tried to create a representative image. The subject, for instance, stands with his weight on one leg – a traditional stance in military portraiture. With his right hand on the barrel of his gun, he stares unsmilingly past the viewer. Representative portraits of this sort generally date from the beginning of the war, which is true in this case. Over the course of the war, portraits that incorporated traditional photographic conventions increasingly gave way to situational photographs that communicated personal sentiments. With this I send you greetings from enemy territory. Thank God this sad scene is not on home territory. We pass through villages that are only ruins now. This evening we take our position across from the enemy. With God’s help, I hope to survive it all and return to my loved ones. We no longer manage to get out of our clothes, and it is often cold at night. We pass so many graves [of those] whose suffering is now over. My address is henceforth . . . (regiment). We are not allowed to divulge our position. We traveled for three days from the border. Until our happy reunion, may you be sustained by heartfelt greetings from your brother-in-law Robert. 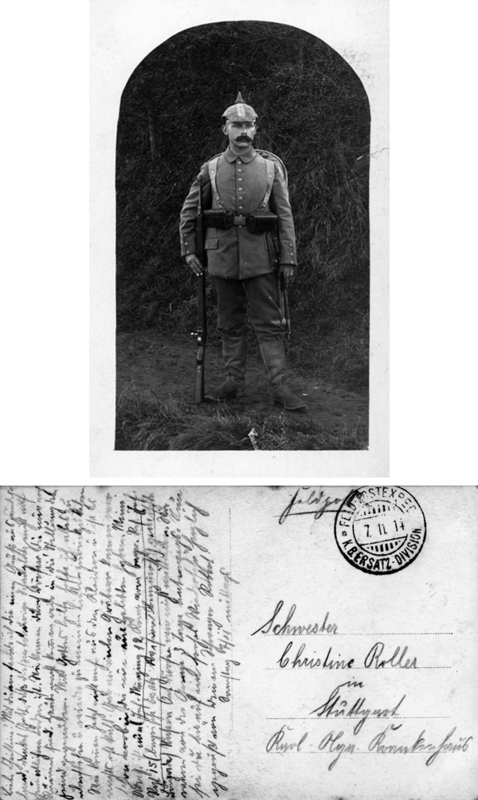 Photographs and postcards are courtesy of the Mauch and Roller families, Weil im Schönbuch, Germany.